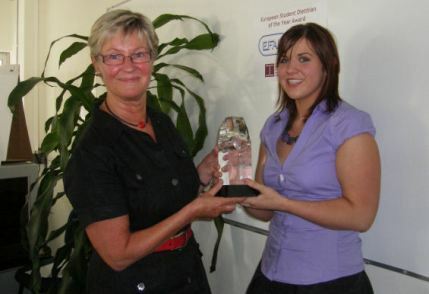 Beaumont Hospital dietitian Eimear Kelleher has won the 2009 European Student Dietitian of the Year Award. Eimear received her award from Harin Kadell, President of European Federation for the Associations of Dietitians (EFAD), at its recent AGM in Lisbon, Portugal. A graduate of the Faculty of Science, Dublin Institute of Technology and Trinity College Dublin, Eimear's research involved comparison of the dietary intake of subjects with Type 1 Diabetes Mellitus managed on multiple daily injections of insulin analogues with current international dietary recommendations and HbA1c% levels - the recognised measure for glycaemic control. She found that almost nine out of every 10 patients in her study, undertaken in Ireland, failed to meet these recommendations and that adherence to recommended insulin regimes was also poor. Both situations would be improved, she concluded, by more intensive dietary education.